Our bee relocations services are effective and responsible to protect your family and the bees. When it comes to keeping your Tampa, Florida home pest free, the two standard techniques utilized are to put a barrier in place to keep them at bay or to exterminate them. When it comes to bumblebees, honeybees, and other bee species, neither of these techniques is effective or desirable. First of all, as a flying insect there is no way to effectively bar them from coming onto your property or flying in an open window. Second of all, mankind needs bees as they are an important part of our ecosystem and our food production would stall to next to nothing without them. This is not to say that you need to be inconvenienced or put in harm’s way should bees take up residence on your property or even within your home. The solution is to relocate them to where they can do their thing in peace and you and your family are safe. 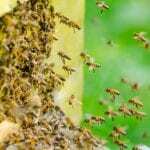 Here at Florida Bee Removal, we first began our bee relocation services more than 55 years ago when we saw that beekeepers were unable to handle the number of bee relocation calls they were getting. We were the first in the state to provide bee relocation as a specialty pest control service and have gone on to train others to do this in an effective and responsible manner. Although we have considerable experience, we never stopped looking at the industry to learn about any new techniques that are being developed so that we can provide you with the best possible service. If you are having a problem with bumblebees, honeybees, carpenter bees, or even other stinging insects, don’t hesitate to give us a call. We will be glad to come out and perform an assessment and inspection and answer any questions you have. We will give you a detailed plan about how we will proceed so you have a full understanding before we begin. Call today to schedule an appointment.